When I accept things to review I always ask myself 'if I saw this on a website, would I buy it?' and if the answer to that is no, I very politely decline. 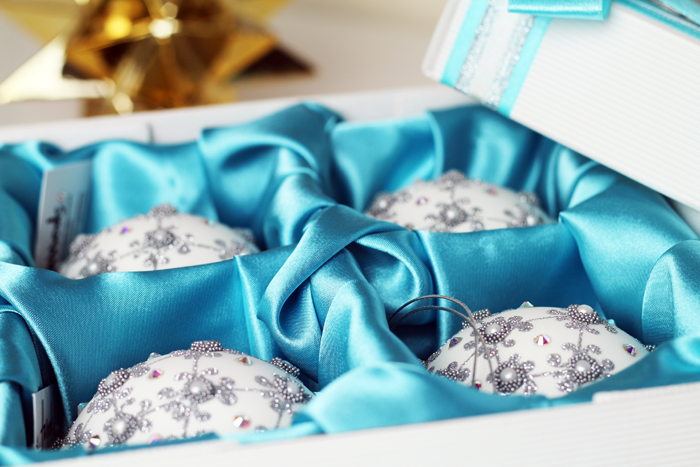 This set of baubles is the only exception to that rule I've ever made because I was so curious as to what four ninety-nine pound baubles would look & feel like. 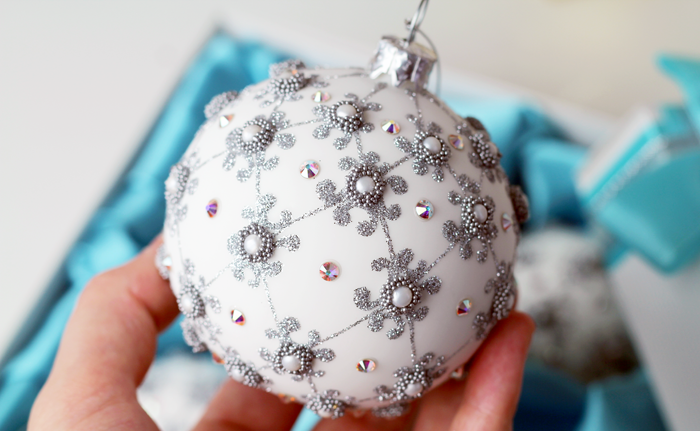 White glass ornaments have been hand-decorated with Swarovski elements & silver glitter. They're undeniably beautiful and I have no doubt they'll look beautiful on our tree where they will undoubtedly have pride of place. They have a very sophisticated aura about them and having them sat in their own satin lined box waiting to be put on the tree somehow makes me feel more grown up that I probably actually am. Christmas isn't about material objects or expensive decorations but I have to say, if I walked past these in the shop and was in a position where I could comfortably afford to buy them, I would, because having a few special things is more than okay. Now whenever I look at these I'm reminded of my space here, how thankful I am for it, and how much joy it has brought me over the last 5 years. And that's pretty special to me. Oooo so pretty!! If I had my way we'd have a tree in every room each with a different colour scheme, white and silver would be beautiful! These are so beautiful and intricate. I love baubles like this so, so much. I definitely approach reviews the same way! 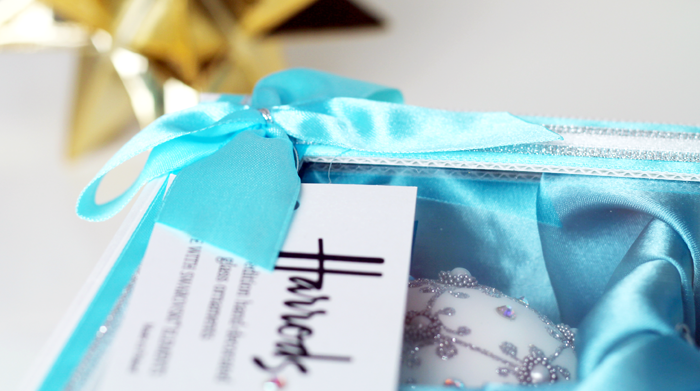 These baubles are so beautiful, I would definitely put them on my tree! If I'd spent nearly £100 on four baubles we wouldn't be getting a tree we'd just frame these instead! They are gorgeous, though. Oh lol that was meant to say 'squeeing' by the way, blummin' autocorrect!! Very pretty. I suppose with decorations, they sort of do last forever in the sense that I certainly don't chop and change mine and they do spend a whole month on display in your home. That would be my justification anyway! 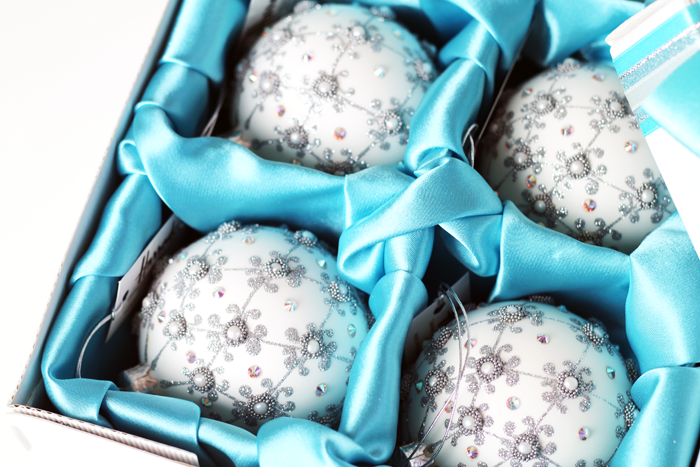 Wow they are absolutely gorgeous and will be perfect for Christmas! Amazing way too approach reviews Jennie! I'm the same. 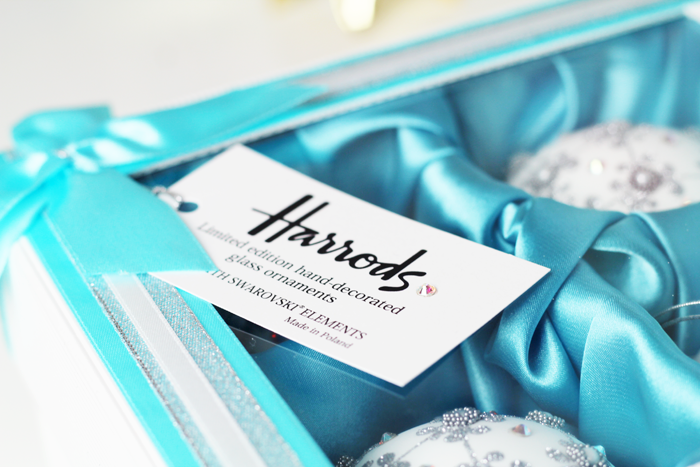 These are absolutely stunning, I'd expect nothing less from Harrods Christmas Collection though. The price is incredibly steep for something you only have on display for a few weeks per year (you're not one of those 2 months of Christmas decorations types are you?!) But if I could comfortably afford them I'd certainly consider them an investment item as they should last for years. They are beautiful- pricey, but then like everyone else has said, if you took care of them well they'd last for many years. Every year we buy a few new decorations for the tree, but something like this would definitely remain a staple forever! You had the exact same thought process as me. Did you see my sparkly globe decoration, these were my second choice. If only I could afford all my decs from Harrods, one day maybe. In my dreams! Wowweee they are so pretty! Although I must admit I'm slightly more in love with the blue silk they come in than the 95£ ball balls themselves! <3 Such nice pictures, they sparkle! 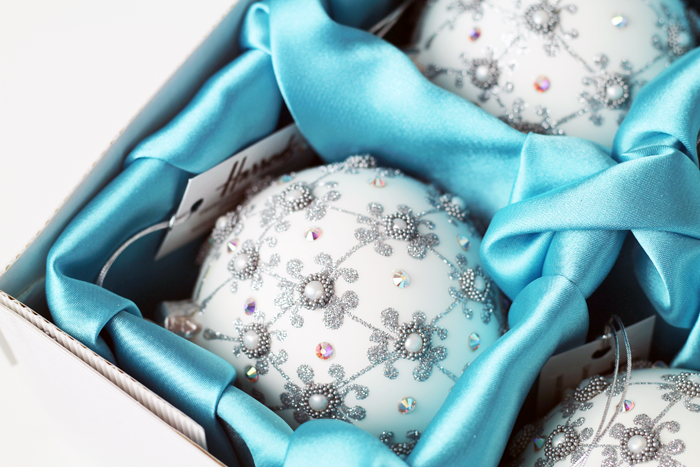 These ornaments are absolutely stunning. I can't help but think about the movie Frozen when I see the blue packaging and the white balls though. I wouldn't mind them on my own Christmas tree. They look absolutely stunning and I'd love to see what they look like on the tree. These are insanely beautiful! I wouldn't normally pay attention to Christmas decorations, but I found myself staring at the photographs for a long while. How are they that pretty?! 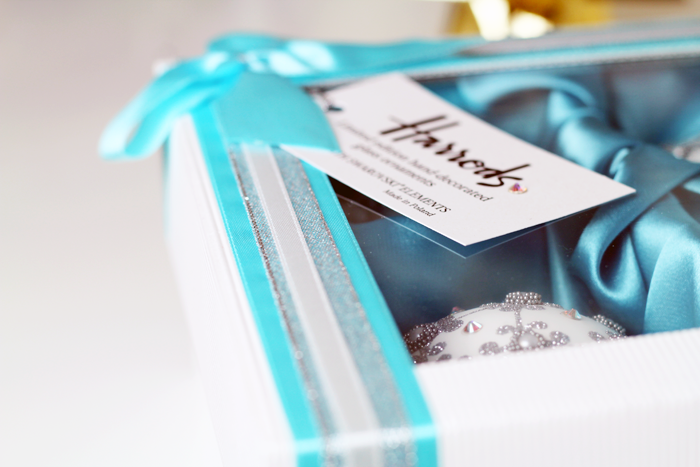 The blue packaging is also so beautiful!